Microscope World Blog: What is a Compound Microscope? By definition, a compound microscope is an optical microscope with two lenses. The two lenses in a compound microscope are the eyepiece lens and the objective lenses. These lenses make up the total magnification on the microscope. For example, if you are using a microscope with 10x eyepieces and the objective lenses are 4x, 10x and 40x, your microscope total magnification = 40x, 100x, 400x. This is the typical setup used in a high school compound microscope. Another term for a compound microscope is a biological microscope or a high power microscope. When compound microscopes were first introduced they used a mirror to direct light up to the eyepiece. Today microscopes typically have a built-in light (usually LED because it is bright, the bulbs last a long time, and it is a cool light that will not damage living specimens). The diagram below shows the popular HS-1M high school compound microscope and details some of the parts of the microscope. 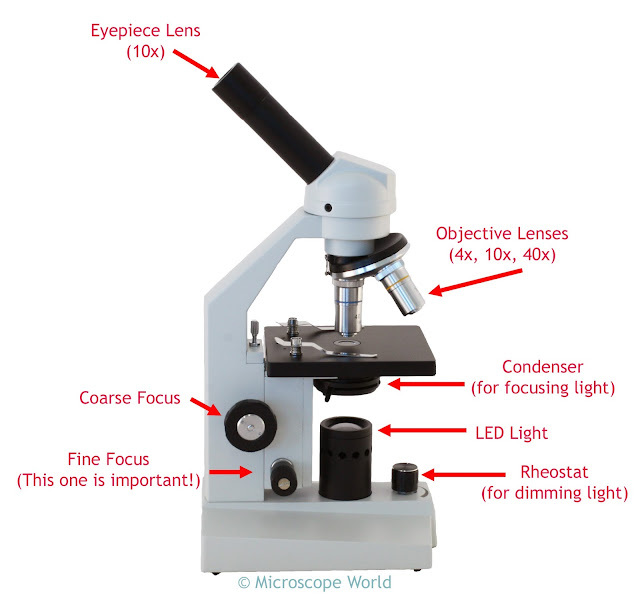 If you have any questions about compound microscopes please contact Microscope World.